A lot of people value indefinite life extension, but most have their own preferred method of achieving it. The goal of this map is to present all known ways of radical life extension in an orderly and useful way. A rational person could choose to implement all of these plans or to concentrate only on one of them, depending on his available resources, age and situation. Such actions may be personal or social; both are necessary. The roadmap consists of several plans; each of them acts as insurance in the case of failure of the previous plan. (The roadmap has a similar structure to the "Plan of action to prevent human extinction risks".) The first two plans contain two rows, one of which represents personal actions or medical procedures, and the other represents any collective activity required. Plan A. The most obvious way to reach immortality is to survive until the creation of Friendly AI; in that case if you are young enough and optimistic enough, you can simply do nothing – or just fund MIRI. However, if you are older, you have to jump from one method of life extension to the next as they become available. So plan A is a relay race of life extension methods, until the problem of death is solved. This plan includes actions to defeat aging, to grow and replace diseased organs with new bioengineered ones, to get a nanotech body and in the end to be scanned into a computer. It is an optimized sequence of events, and depends on two things – your personal actions (such as regular medical checkups), and collective actions such as civil activism and scientific research funding. Plan B. However, if Plan A fails, i.e. if you die before the creation of superintelligence, there is Plan B, which is cryonics. Some simple steps can be taken now, such as calling your nearest cryocompany about a contract. Plan C. Unfortunately, cryonics could also fail, and in that case Plan C is invoked. Of course it is much worse – less reliable and less proven. Plan C is so-called digital immortality, where one could be returned to life based on existing recorded information about that person. It is not a particularly good plan, because we are not sure how to solve the identity problem which will arise, and we don’t know if the collected amount of information would be enough. But it is still better than nothing. Plan D. Lastly, if Plan C fails, we have Plan D. It is not a plan in fact, it is just hope or a bet that immortality already exists somehow: perhaps there is quantum immortality, or perhaps future AI will bring us back to life. The first three plans demand particular actions now: we need to prepare for all of them simultaneously. All of the plans will lead to the same result: our minds will be uploaded into a computer with help of highly developed AI. The plans could also help each other. 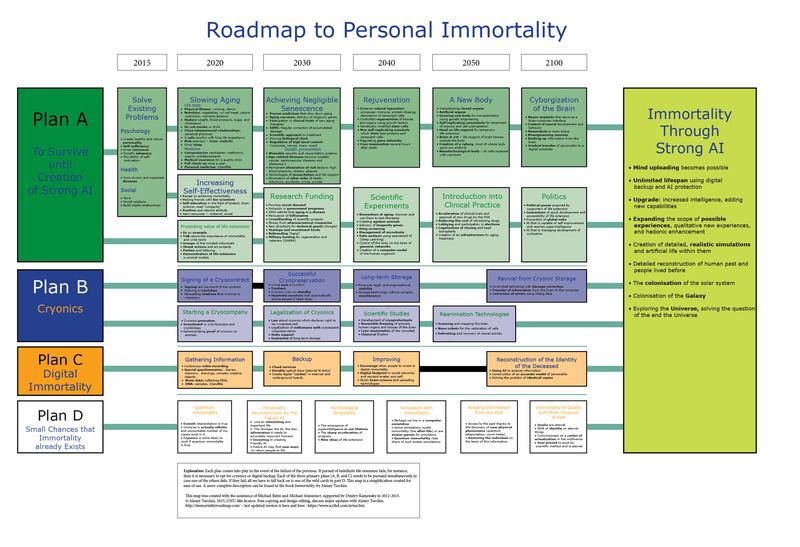 Digital immortality data may help to fill any gaps in the memory of a cryopreserved person. Also cryonics is raising chances that quantum immortality will result in something useful: you have more chance of being cryopreserved and successfully revived than living naturally until you are 120 years old. After you have become immortal with the help of Friendly AI you might exist until the end of the Universe or even beyond – see my map “How to prevent the end of the Universe”. A map of currently available methods of life extension is a sub-map of this one and will published later. The map was made in collaboration with Maria Konovalenko and Michael Batin and its earlier version was presented in August 2014 in Aubrey de Grey’s conference Rejuvenation Biotechnology.